After the success of the original Mass Effect Trilogy, Mass Effect: Andromeda aims to start off a new adventure in a new galaxy, with the task of finding a new home for the thousands of colonists who joined the Initiative for a fresh start in Andromeda. You play as Scott or Sara Ryder, taking over your father's attributions as a Pathfinder and setting course for new locations to discover and colonize in the new galaxy, only to find out that Andromeda comes with its own intruders in the form of kett, a highly advanced alien race that has been in a war with Andromeda's locals, the angara, for years. As the human Pathfinder it is your job to find a new home for humanity in the Andromeda galaxy, but throughout your journeys you will encounter other species such as the asari, turians, salarians or krogan from the previous installments and forge new alliances with the new race, the angara. As big as the cast of characters and species variety is, it falls short when compared to the original trilogy as previous races such as the drell or the quarians seen in Mass Effect 2 and 3 are absent, and the angara alone are not enough to justify a whole new galaxy to see and explore. There are five main planets that you can fully explore in your Nomad, each one of them unique in its own way, starting with Elaaden which is a desert planet and an ideal candidate for krogan settlements, Eos, the first inhabitable planet the Initiative discovered in Andromeda or Voeld, a planet with an icy surface, currently serving as home of the angaran military in their war against the kett. 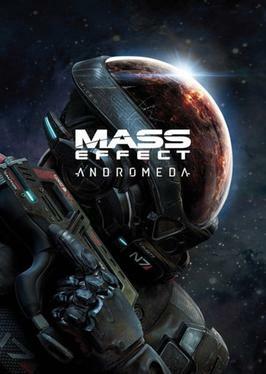 In addition to those there are also smaller areas that you can explore on foot such as Aya, the golden world of the Angara or the Nexus which serves as a central command post for the Initiative, so in that aspect Andromeda is more of an open world game than any previous installments in the franchise, yet at the same time it feels more empty than Mass Effect 3, as each world, despite its massive scale, feels compressed by the amount of fetch quests and errands that rarely have a side story attached to them. Throughout the main story, you will visit all of those planets and it is up to you to decide if you want to activate the remaining remnant sites in order to increase the viability level or complete more of the side quests in exchange for experience, credits and items, but the problem with most of those quests is that they are often repetitive, as they follow the already familiar open world idea of fetch and collect quests and push it to its very limit, until it eventually gets boring. There is a lot to do in Andromeda as all quests added up can easily take you nearly 100 hours to complete, but aside from those loyalty side quests that will give you a better background story for each one of your squad mates, the rest of them are just there to fill in the gaps and increase the overall length of the campaign without any considerable reward. Your main enemies are the kett, which will constantly try to stop you from inhabiting new planets and accessing their vaults, however the Archon, which serves as the leader of the kett in the Andromeda galaxy doesn't even come close to villains such Harbinger from Mass Effect 2, and his reasons are purely evil and made clear from the very beginning, making the whole story be more about where will humanity end up settling eventually rather than how the kett will be beaten. After Mass Effect 3 dropped almost all RPG elements in exchange for a more fluid third person shooter experience, Andromeda continues that trend while still trying to satisfy old Mass Effect fans with a crafting and inventory management system that ended up being way too complicated and pointless for everyone to use. In order to craft a new piece of armor or weapon you have to research its blueprint first by spending research points acquired by scanning different objects throughout the world, then collect the required amount of materials and only then craft the armor or weapon itself; the problem is that after all this effort the outcome is disappointing, as weapons collected from the worlds you visit or awarded during quests are often better and armor stats are influenced more by mods rather than the blueprint itself, so once I crafted my first one I had no reason to go back and try out the other ones, but instead opted to find better mods and replace my older ones on the armor I already had. Dialogue interface has been changed to better reflect the outcome of that certain option by displaying little icons next to each one, so you will know if your response will trigger a positive or negative reaction, or even if it will result in a romance conversation, however apart from the romance bits, your response will rarely change the story itself, but instead trigger a different conversation path from the character that you are speaking to, which will ultimately lead to the same conclusion no matter what. There are still a lot of alternative questions that you can ask certain characters to get more background on a quest, their personality or the world around them, but those are purely informational. Combat has changed drastically as the jetpack gives your character more freedom of movement and combined with the automatic cover system it really feels different from any other Bioware game, and even if it does take some time to adapt to the new movement mechanics as you will have to use your jetpack a lot in order to get out of harm's way or reach different areas, once you do get the hang of it, it's actually much easier to control and it does make combat more fun and opens up new strategies. The same cannot be said about your squad, as you can no longer give specific commands to each squad mate, so you are limited to movement commands only, which compared to the original Mass Effect trilogy where you could issue specific commands to use a skill at any given time for each character, this comes as a huge disappointment in Andromeda as squad management is no longer important, so you might just let them auto level up anyway, since you can't make them use the skills you assign them when you want to. On top of that there are the technical problems, which even after a few patches still exist and some of them can be really frustrating; I intentionally waited a few weeks before reviewing Andromeda hoping that most of those issues would be fixed, and while some of them have been, there are still a lot of unresolved bugs that range from something as simple as being stuck in the environment and having to reload a checkpoint, to more permanent issues such as being stuck on a quest because the object is glitched, an issue that I still have to this day on the quest about the Asari Ark. Since launch, facial animations have come a long way, but they are still nowhere near to the high quality, almost cinematic experience, of games such as The Witcher 3, and with bad facial animation, bad lip sync comes packed, something that is impossible not to notice at this point. Apart from that, graphics overall aren't bad at all and the environment variation from one planet to another make the whole space exploration come to life as you constantly bump into new plants and rock formations that are simply beautiful to look at. Galaxies and planets are particularly amazing, as throughout your journey you can choose to scan other planets for resources, apart from the ones you can actually land on, and with such beautiful colors and a combination of planets, moons, asteroids and wreckage, each galaxy feels unique and beautiful in its own way. Andromeda doesn't feature any mainstream actors from the TV or movies media like in the original trilogy, as the cast is mostly made up of people known only as voice actors in the video games industry, with Fryda Wolff and Tom Taylorson taking the lead as Sara and Scott Ryder, while other actors such as Jules de Jongh, Nyasha Hatendi, Gary Carr or Christine Lakin complete the rest of the Tempest's crew. Probably the only celebrity on the cast list is Natalie Dormer, known for her role in Game of Thrones, but unfortunately for her fans you will barely interact with her as she takes on the role of Dr. Lexi T'Perro, the Tempest's doctor, a character that you will only interact with on a few occasions throughout the game; there is also no romance option with that character if you were hoping for some Tyrell loving. Nonetheless, all actors deliver their lines in theme with the character, the problem here comes from the huge lip sync issues and the sometimes pointless dialogue lines, rather than the actors. Overall the sound quality is what you would expect from a major triple A video game and the soundtrack does a decent job keeping up with the action, however no track comes anywhere close to the tunes from the original trilogy such as the credits song from Mass Effect 1 or the Earth Song from Mass Effect 3, which again, compared to everything that previous games in the franchise have achieved, it once again comes as a disappointment in Andromeda. There are around 90-100 hours of single player content, with all side missions and tasks included, so there is no lack of content in Andromeda, it all comes down to how much time you're willing to spend with fetch quests. In addition to that there is the Multiplayer mode that puts you in a team of four against multiple waves of enemies with different objectives. This is a concept that we have seen before in multiple games including Mass Effect 3, and while it's nothing breathtaking or revolutionary in any kind it does provide a good distraction for people willing to spend more time in Andromeda and playing more strike missions will eventually unlock more characters and weapons for you to try out against harder waves of enemies. Mass Effect: Andromeda is still a good game for many reasons, but when compared to the high standards imposed by its predecessors it falls short in a lot of categories. However, treated like a game without any comparisons to previous installments, there is still a lot to do in Andromeda and exploration and combat are both equally fun no matter what, just beware of the technical difficulties for the meantime.